Police are searching for two robbers who stormed two different convenience stores in less than an hour early Monday morning. SAN DIEGO (CBS 8) – Police are searching for two suspects who stormed two different convenience stores in less than an hour early Monday morning. Authorities said one suspect had a handgun and the other had a machete. 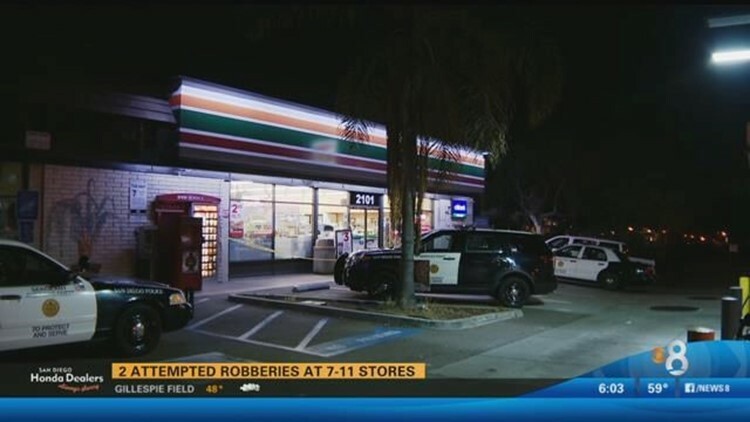 The first attempted robbery happened at a 7-Eleven at 30th Street and Fern Street in South Park just before 3:00 a.m.
Investigators said two Hispanic males in dark clothing approached a clerk demanding cash, but fled empty-handed when the clerk ran off, police said. Then, 45 minutes later a second 7-Eleven was robbed at Fourth Avenue and Robinson Avenue in Hillcrest. There could be a possible link between these hold-ups and a robbery last Tuesday at Fifth Avenue and Spruce Street. The suspect descriptions and use of weapons are similar. Police described one of the suspects as Hispanic, about 5 feet 7 and heavyset. He was wearing a mask, a hooded sweatshirt and jeans. The other was Hispanic, about 6 feet tall and wearing a black shirt and jeans.